Glenvarloch is ideal for those visiting who want a truly memorable self-catering holiday, with mountain and forest views, and Village facilities within 200 metres. Glenvarloch sleeps to 6/8 people, in 3 bedrooms (one en-suite) plus a substantial double sofa bed in its own room. Two of the bedrooms, the double and twin, are on the ground floor and they both share a double shower and w/c. The house was built on the site of a Log Cabin, and was completed in 2006. We look forward to welcoming you to Glenvarloch. If you have any queries or require any assistance please call 07582 315802 or email: admin@trossachsactive.com. 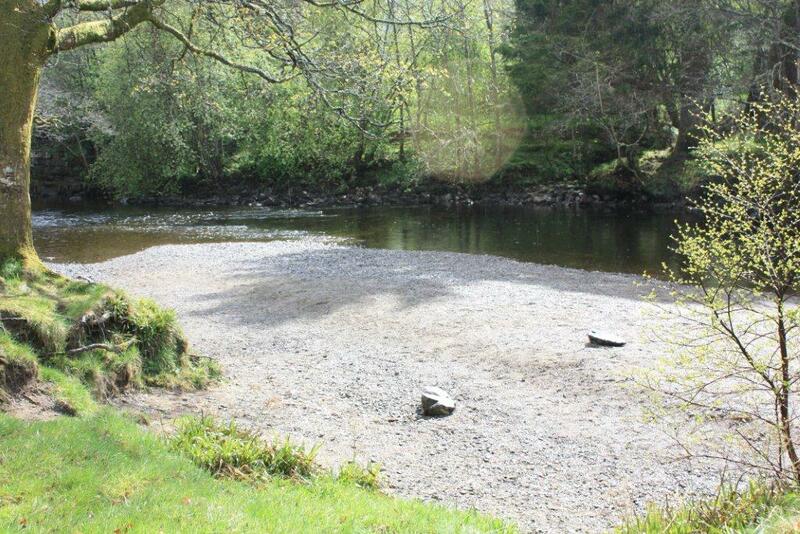 The nearest bus stop is outside the Strathyre Shop & Post Office some 200 metres from Glenvarloch. In the main season there is a regular bus service from Edinburgh, and in addition there is a local bus service (Kingshouse) from Callander to Strathyre, with links to Stirling bus station from where Scot Rail services can be accessed at other times. As far as we are aware neither of these services currently accommodates wheelchair users. There is a Traveline Scotland widget on our website http://www.trossachsactive.com/page7.php which suggests public transport options from your starting point to Glenvarloch. The main road outside the house has a narrow paved path slightly uneven in places. Access to the grounds is via a farm style gate which is on an incline and leads to a graveled driveway. Shopping can be delivered by either Tesco or Sainsbury’s via their online website to Glenvarloch, FK18 8NA. The keys are accessed by Keysafe by the front door, which is 1400mm above ground level. Parking is available up to 4 cars immediately outside the property on the driveway and includes a level setting down area. The parking has a graveled surface with level paved walkway and ramp and handrail giving access to the back door. Whilst there are no lights on the driveway the front door has a motion sensor light by the Keysafe from where level, and then ramped access is gained to the back door. The front door is 940mm wide. The front door access has 2 steps. One step up (160mm), and then one step up and over the threshold into the property (200mm). The floor covering inside the front entrance is inset coir matting leading to hardwood floor. The rear access via a graduated step 55mm high, the doorway is 775mm wide. There is a 20 mm lip leading to quarry tiled flooring. The entrance to the back door is well lit via outside light which can be arranged to be turned on for your arrival. The ground floor of Glenvarloch is split into two areas. Area 2) The two ground floor bedrooms and ground floor shower/wc. These are connected by a hallway which is 1050mm wide. The hallway leads to a ‘Stable-door’ with access to the rear ramp and emergency exit, this is 680 mm wide and which has a 50mm lip over the weather proof thresh to get to the outside. Area 2 is accessed from Area 1 on the same level via an interconnecting door with a width of 790mm wide. The hall and both bedrooms have mats which are easily removed. Area 1 has a Freesat TV with remote control, and a comfortable seated atrium with views to the mountains, adjacent trees and stream. The dining table seats 6 and has 4 legs one in each corner, and from floor to lowest point of table under space is 630mm. Floor to highest point of table is 760mm. There is ample free space around the table for wheelchair access. All chairs around the table are moveable and have padded seats with no arms. There are further chairs for the dining table if needed. Lighting is natural daylight plus overhead LED spotlights and occasional lamps. The Kitchen is part of the open plan ground floor area 1. The doors of the ovens drop down and the handles are Top Oven 730mm and Lower Oven 480mm from the floor. The controls for the ovens/grill are above the floor. The electric hob is 930mm above the floor with the 4 control knobs to the right hand side of the top surface, the oven control knobs are on the front of the cooker and are 830mm above the floor. There is a microwave oven with front facing controls the highest being 1000mm above the floor. The plinth is 800mm above the floor. Worktops and sink are 920 to 940 mm above the uneven quarry tiled floor. An American style Fridge /Freezer is provided, the highest shelf in fridge is 1500mm, and the lowest drawer in the freezer is 380mm from the floor. Glasses and crockery can be moved to lower cupboards if required – please request on booking. There is a central island in the Kitchen area with a height of 920mm, around which are spaced 3 bar stools whose seats are 630mm from the floor. There is easy open access around the island. The Kitchen is well lit with LED spotlights above work surfaces and appliances. The door to this bedroom is 720mm wide. The bed can be accessed from both sides and furniture can be moved if required. The bed is 700mm from the top of the mattress to the floor. Either side of the double bed are small round tables with bedside lamps on with pull cord switches. The flooring level and laminate with a removable mat. There is a double fronted oak wardrobe with High level rail 1800mm from the floor and a low level drawer 380mm from the floor. Natural lighting is provided via the window and overhead ceiling light. The access door to this bedroom is 730mm wide. One of the two single beds can be removed for easier access by arrangement. Height to the top of the mattress for each of the single beds is 560mm from the laminate flooring. Either side of each of the single beds are bedside tables with table lamps on them. There is non-feather bedding. There is a wardrobe with a hanging rail 1620mm from the floor and a3 drawer chest with a maximum height off the floor of 1000mm. The room is well lit from a single ceiling light. The door to the Master bedroom is 750mm wide, and consists of a King size bed with good open access from the side nearest the door to the en-suite which is 760mm wide. All bedding is non-feather. The height of the bed from the top of the mattress to the floor is 600mm. There are 2 small bedside tables on either side and a dressing table on which stands a small Freesat TV with remote controls. In addition there is a recliner chair and French windows which can be opened to offer excellent views to the garden and hills. There is also a large fitted wardrobe which has two sliding doors for storage, with high 1970mm and low level 1170mm hanging rails. In addition there is a ‘tallboy’ chest of drawers with drawers with a range of access heights up to 1260mm. Lighting is natural daylight plus overhead lighting and bedside lamps. Step free level access onto tiled floor. There is a second door, from the minstrel gallery of width 740mm, into the en-suite bathroom. This room’s is access is 760mm wide, the Sofa Bed mattress is 420mm off the floor. The main lounge area is on the first floor which is accessed via a spiral staircase which has 11 hardwood steps and is quite steep, with typical step height of 230mm. This leads to a level first floor which is of Oak flooring with one mat which can be removed. The minstrel gallery / lounge area is open plan and has a mixture of seating (3 seater / 2 seater sofa / single armchair) together with a low level coffee table. Furniture can be moved to accommodate your requirements. There is a 42 inch flat screen Freesat Smart TV and DVD player both with remote controls. There is good natural daylight over head lighting and table lamps are in the room. Sofa Bed / Quiet Room has a separate table with an adjustable office chair. There is a large 1000mm quadrant power shower which has a step into it of 220mm high, and maximum access width of 600mm. There is one suction grab handle and a shower seat which can be used for either of the two bathrooms. The toilet is 400mm high, and is adjacent to the wash basin which is 590mm high from the floor. The toilet flush is ‘an inset flush’ located on top of the wooden shelf above the toilet – at a height of 1300mm from the floor. There is also a Whirlpool Bath with raised moulded seat, coloured lighting and water jets. Both the Wash Basin and Whirlpool bath have lever taps, although the one at the wash Basin is operated side to side and up and down, whereas the two Whirlpool bath taps are only operated side to side. The Whirlpool Bath waste plug is operated by means of a circular knob where the water comes out. There is also one high wooded stool in this room with a height of 600mm from the floor. The door is 790mm wide and leads to a double width (1100mm x 700mm) rectangular shower cubicle with sliding doors with maximum access width of 680mm. The step up into the cubicle is 250mm from the floor. A suction Grab handle and shower stool are available for one of the two showers only. There is access to the toilet past the wash basin of 700mm wide. The toilet is 400mm high, with a flush button ‘inset’ into the top of the shelf behind the toilet at a height of 1000mm from the floor. The wash basin is 800mm from the floor and has a single mono-bloc tap with lever mixer handle and lever waste. This shower room is well lit from overhead and side lights either side of the mirror above the wash basin. There is also a simple wooden chair 460mm above the floor which is located by the shower cubicle. This is located between the back door and the Kitchen. The door opening is 790mm wide. There is a standard size washing machine and separate dryer – both front loading. The room is lit by 2 overhead ceiling lights. There is a small paved patio area at the front door which can be accessed from the front or back door. There is a table and six chairs available with parasol for your use. The Garden area is laid mainly to grass and is made up of two areas the larger one to the front, and a smaller one to the rear, beyond the unused static caravan. 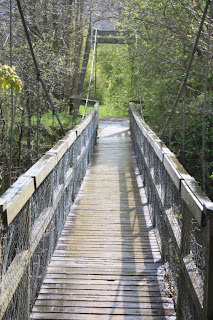 The whole site is approximately half an acre and provides ready access to many local walks around the village in addition to the Rob Roy Walking Trail and C7 Cycle route interesting places to visit nearby. All areas in the house have good colour contrast between the floors, doors and walls. Mobile ‘phone reception can be intermittent. Wi-Fi is included and is excellent throughout property. 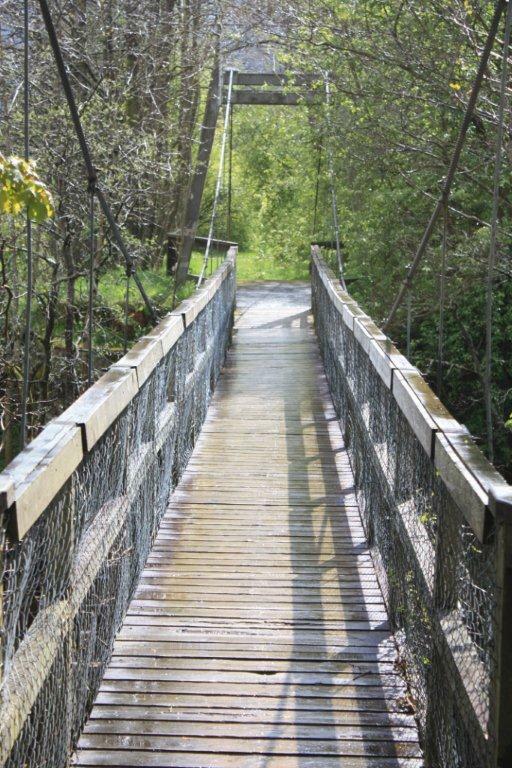 The nearest Doctors surgery is 10 miles away in Callander Tel: 01877 331000. The nearest General Hospital with A&E Unit and Walk-in is at Stirling – further information is in the Welcome folder. Please check with local attractions, restaurants etc directly for their own access statements. We are planning to improve our website over the next 12 months to make it more accessible, your comments would be welcome to assist us with this project. We will also investigate joining the Visit Scotland Accessible Accommodation Scheme. From 4pm on day of arrival to 10am on day of departure - Open All Year Round. 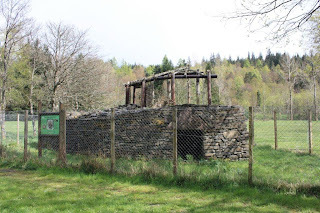 Hidden away at the end of the track through the Forestry Commission car park at the South end of the village of Strathyre within The Loch Lomond and Trossachs National Park is the result of an ambitious project to find the answers to some serious questions regarding the structures known as Brochs. The location of the Broch in Strathyre is adjacent to the Strathyre suspension bridge (above) and the famous Strathrye 'Beach' alongside the River Balvaig (below). The Broch is a totally Scottish Phenomenon not found anywhere else in the world. Built principally from Devonian Sandstone 450 million years old some of the finest examples exist on Shetland. In 1925 a storm revealed the Skara Brae village on Orkney and it's associated ancient stone 'furniture' - it is from this time that Broch's dominated. The above is an amazing example of preserved 2000 year old craftsmanship on the islet of Mousa part of the Shetland Isles. It stands fully 10 metres high and 8 metres in diameter. The walls are 5 metres thick - 2m for the outer, 2m for the inner with a 1 m cavity between. The structure is huge and sophisticated in construction containing stone spiral stairs within the walls, ventilation, and window openings, as well as facilities to support internal wooden beams and flooring. Much has been written on Brochs about the who, what, where and when, and the common view is that they were built as defensive structures. However, nobody has really shown HOW they were built. Other examples are Clickimin on Shetland and Dun Carloway on The Isle of Lewis. What was the method of construction ? How much stone was required ? How many people would it take to build one ? How long would it take to complete the job ? 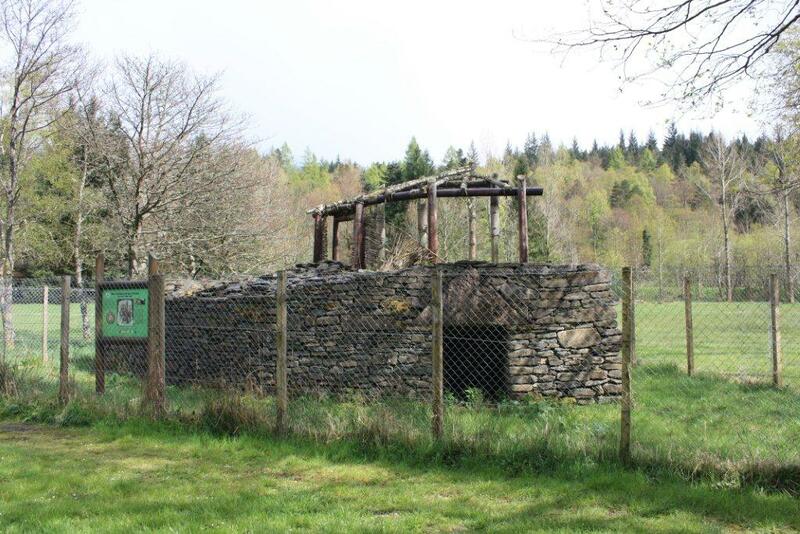 With the aid of 20 people, members of the Dry Stone Walling Association and some villagers Irwin set out to answer these questions - and the segment of the Broch that was built is still there to view today. As is a DVD on the project The Broch. It seems then that round buildings were preferred to angular ones due to the ease with which they could be set out via a central post and a length of string for alignment. The immense walls not only being 5 m thick with a 1m staircase built-in, but the stones were sloped down and outwards to avoid rainwater ingress - to create a 'Batter' with the diameter reducing the higher the structure. No modern tools or materials were used - but Hammer Stones - simple beach cobbles - used as is likely the original builders had access to such implements. What transpired was an involved and testing project for the participants particularly when the central post which was delivered by the Forestry Commission proved too huge for 12 able persons to lift - and it had to be reduced by a third. The workmanship of the stone is obvious for anyone who cares to pay a visit, the carefully selected stones were shaped and placed individually and the spaces between packed with 'Harting' - thought usually done by the women and children of the village, so it was a truly communal effort. The section of Broch that was built is barely 2 m high and is made up of 60 tonnes of stone and took the combined efforts of 20 people. 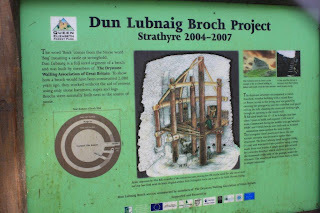 Thus it was concluded that a complete 8 m high Broch would have consumed over 2500 tonnes of stone and taken 20 people a whole year to build, that is excluding the amount of time taken to quarry and transport the stone - which would probably have taken another year to complete. 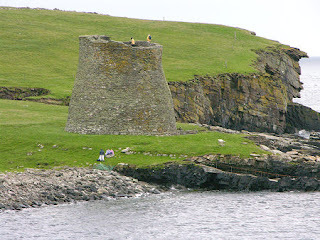 Irwin states that this implies a period of stability, and therefore declares that the Broch was not intended as a fortress but as an ostentatious symbol of a Chieftains wealth. This is a similar conclusion to that arrived at by the archaeologist's who uncovered and rebuilt The Crannog in Loch Tay. . . . .perhaps the subject for another blog . . . . . . . .